Want to use less water on your commercial property? Most commercial properties in the Triangle area already have irrigation systems, Davis says. But many could use updates to reduce water use. Chris Moore, irrigation manager at Greenscape, Inc., makes it easy. Think updated nozzles. Native plants. Reclaimed water. New technology. You’ll notice a difference, he says. Preventive maintenance can save water — and save money by tending to potential problems before they become disasters. “We can replace heads that are no longer turning, raise heads that are too low, replace clogged nozzles and bring your system up to how it’s supposed to run,” Moore says. A leaky valve will waste water and increase your water bill. Sprinkler heads clogged with debris spray erratically, spraying too much water on some areas and not enough on others. That means a soggy landscape and wasted water. It’s a simple step that makes a huge difference. Check valves prevent water from draining out of the pipes through the lowest sprinkler in a zone. 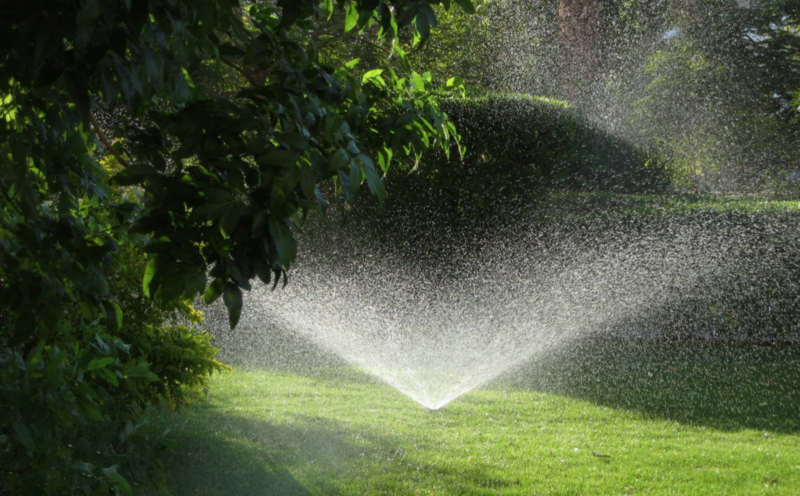 Then, because your line is now empty, it will take more water to fill it up again when your sprinklers turn back on. “A lot of companies have very high water pressure,” Moore says — much higher than the 30-45 psi an irrigation system needs. That extra pressure creates a misting effect, he says. You may have noticed it — a fine mist spraying out of sprinkler heads. “That mist gets blown off your grass or onto somebody else’s property, wasting water,” he says. Extra pressure also puts unnecessary wear and tear on your entire system, he says. The answer: a pressure regulator. It can be installed at your backflow, on each irrigation zone valve or on each individual sprinkler head. Lots of water is wasted when the clay soil can't absorb it and it runs right off into the street, he says. These nozzles spray water at a much slower rate, allowing the soil time to absorb it. There’s no excuse today for heads that overshoot their target, spraying valuable water onto sidewalks and other hardscape. As landscaping changes, it needs different sprinkler heads, Moore says. Shrubs get bigger, leaving less turf to water. Or shrubs get removed, leaving more turf to cover. “These days, there’s a nozzle for every weird-shaped piece of grass you can think of,” Moore says. If your irrigation system hasn’t been updated with this water-saving technology, it should. Smart irrigation controllers use data from sensors and local weather forecasts to deliver just the right amount of water at just the right time, with little waste. Our technicians program it to water your property accurately and precisely, based on your individual needs. And it’s smart enough to detect any problems with your system. If a line breaks or another mechanical problem pops up, it automatically turns off. This water-saving irrigation is perfect for flower beds, Moore says. “Drip irrigation waters at a very slow rate, delivering water right at the base of the plant so it absorbs through the roots,” he says. Micro irrigation uses tiny sprayers in conjunction with the drip system. Less water, exactly where it needs to be. “If you want to save water, you can’t beat native plants,” Moore says. “I’ve really noticed a trend toward this, instead of using exotic plants that hog a lot of water.” Natives are the ultimate in easy care, because they automatically love where they’re planted. Not only do they require less water, but they’re hardy, so they fend off pests and diseases. When you plant natives, you’re helping out nature’s wild creatures by providing berries and seeds, layers of great shelter and nectar for pollinators. 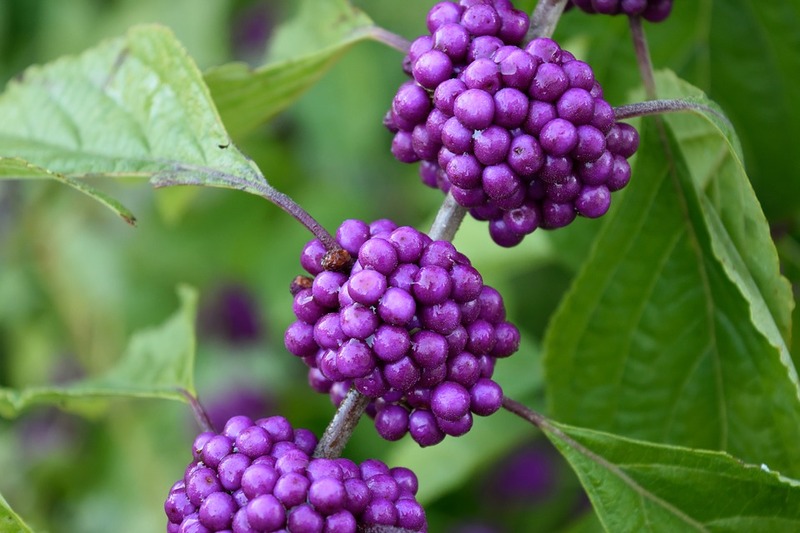 North Carolina boasts a host of beautiful native plants, from passion flower to Virginia sweetspire to purple beautyberry. All of the wow, with a lot less water. “People are so attached to turf, but it’s a real pain to keep grass green around here,” Moore says. Consider keeping turf only where it will grow the best, he says. “Lots of areas have too much shade, too many trees for grass to thrive,” he says. Use low-maintenance hardscape, mulch, native plants, shade plants or ornamental grasses instead, he says. We love mulch. Not only does it make your property look great, but it helps your soil retain valuable moisture, saving water. But old mulch won’t do the job of the new fresh stuff. New mulch keeps your plant’s roots cool, retains moisture in the soil and deters weeds. At Greenscape, we replace mulch twice a year or so. If you do this, tell the public about it, he says. A shopping center with a Whole Foods store posted signage that explained its water collecting system, he says. Use of reclaimed “gray water” from municipalities is on the rise, Moore says. Companies need to have their pipes retrofitted with purple piping to indicate the water isn’t drinkable, but used only for irrigation. “It’s a great way to re-use water,” he says. These smart irrigation strategies will save water, which will save you money. “But this isn’t just about your rate of return,” Moore says. “It's also about perception. Your tenants at your office park don’t want to see your sprinklers going when it’s raining. They don’t want to see excess water pouring over the curbs and out into the street. Chris Moore, Irrigation Manager, Greenscape, Inc.